A fun soccer invitation is to write the party information in permanent marker on small plastic soccer balls. Using clipart make fun soccer invitations with all your favorite players on the front. Find round soccer theme invitations or make your own using white cardstock. Trace and cut out a circle shape leaving one side uncut on the fold. 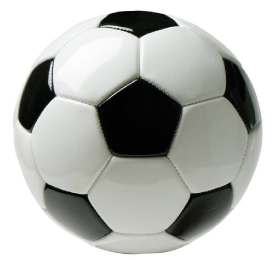 Draw in black spots on the soccer ball. On the invitation ask your guests to dress in their soccer jerseys. Decorating for a soccer theme birthday party is easy. Decorate the food and party table in green tablecloths to represent grass. Find fun soccer ball themed plates and cups and your table instantly becomes a soccer field. Use white pin striping tape to mark the lines of a soccer field on the green table cloths. Hang black, white and green streamers along with black, white and green balloons to make the party festive. As guests arrive at the party greet them with orange cones lining the front walkway to your door. Place soccer balls in the front yard and tie black, white and green balloons to the mailbox. Have adults and older kids who will be helping at the party dress in referee shirts. Hire some local High School Soccer Players to attend your party and run a soccer mini-camp. If you don't know anyone personally contact the school athletic department. Let the guests decorate small plastic soccer balls that they can take home with them as a party favor. Decorate fun foam visors using foam cut-outs, glitter and stickers. Soccer Obstacle Course - This is fun for kids of all ages and skill levels. Create an obstacle course using common backyard items that the guests will have to dribble a soccer ball through the course and back. Take turns letting the children use a stopwatch to time each other. Set up obstacles using trampolines (they either have to dribble over, or under it), swing sets (dribble in between swings), slides, hoses (lay on the ground in a curved position so they have to follow it as they dribble), set up cones so they can dribble around them ... use anything that is available in your backyard. The Obstacle Course can be done individually or break up into teams and make it a relay. Once the guests have each had a turn let them go again only this time make them go backwards. Make up several contests with small prizes for the winners. Dribbling Contest - set up a long line of cones and see who can dribble the soccer ball while weaving in between them the fastest. Goal contest - set up a soccer goal in the backyard or at the park and see who can make a goal from the farthest or most difficult spot on the field. Up in the air - see who can keep a ball from touching the ground the longest with their heads. A soccer scrimmage is always fun. Divide the kids into 2 teams or have them play against the adults at the party. Fun blow up soccer balls, whistles, stopwatches, soccer themed pens, cups or stickers. Soccer themed cups are great to hold party favors. Wrap up party favors in a black and white bandana.